You don’t have to go a long way to get away, at least not if you’re heading to Williams Pond Lodge in Bucksport. 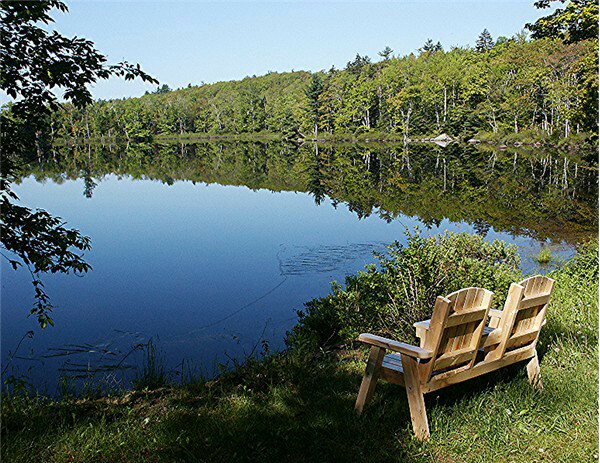 The Williams Pond Lodge is an ecofriendly, off-the-grid bed-and-breakfast surrounded by more than 20 acres of wooded land located at the base of Hoxie Hill and on the shore of Williams Pond. Owners David Weeda and Dominick Rizzo excel in their hospitality and make guests feel welcome from the moment they set foot outside their vehicles to the last wave goodbye as they disappear down the dirt road leading away from the cozy getaway. The renovated camp, located just off Route 15 on Williams Pond Road, is secluded but easily accessible. It’s a 15-minute drive from downtown Bucksport, 20 minutes from Brewer, and 30 from Bangor International Airport. It features 3,000 feet of frontage along the spring-fed, 50-foot deep pond, kayaks, canoes, swimming, hiking trails and solar power. The rooms have no TV sets, but guests have Wi-Fi Internet access and can watch DVDs or VHS movies in the lodge library — but why would anyone want to with the abundance of sights and views to take in and photograph. The breakfasts prepared by Weeda and Rizzo are homemade and uncommonly tasty, from pastries to seafood omelets to more standard fare like waffles, pancakes, popovers, yogurt, cereal and coffeecake. There isn’t much they can’t prepare. While the lodge and location may be rustic, the rooms are not, at least not in terms of comfort, ambience and atmosphere. Williams Pond Lodge is difficult to leave, and it’s is the easiest way to get out of the city without having to go very far. For more information, call 460-6064, go online at www.williamspondlodge.com or send mail to Williams Pond Lodge, P.O. Box 461, Bucksport, ME, 04416.